Scarves should be 7″x 50″. Hats should fit an adult head. For easy hat instructions, click here! Drop off all knitted or crocheted scarves and hats to Jewish Volunteer Connection at the Weinberg Park Heights JCC, 5708 Park Heights Avenue. JVC can help to coordinate collection items off-site if needed. Please deliver all items by December 13, 2018. 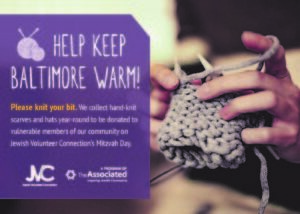 For more information contact JVC at 410-843-7490 or jvcbaltimore@associated.org. Thank you for knitting your bit! We also collect yarn and knitting materials year round!